The U.S. Air Force's unmanned X-37B space plane has flown four clandestine missions to date, carrying secret payloads on long-duration flights in Earth orbit. The robotic vehicle resembles NASA's famous space shuttle but is much smaller. The X-37B is about 29 feet (8.8 meters) long and 9.5 feet (2.9 m) tall, with a wingspan just less than 15 feet (4.6 m). At launch, it weighs 11,000 lbs. (4,990 kilograms). "The primary objectives of the X-37B are twofold: reusable spacecraft technologies for America's future in space and operating experiments which can be returned to, and examined, on Earth," states an X-37B fact sheet produced by the Air Force. Like the space shuttle, the solar-powered X-37B space plane launches vertically, with the aid of a rocket, and cruises back to Earth for a runway landing. The diminutive space plane is designed to operate at altitudes ranging from 110 to 500 miles (177 to 805 km). 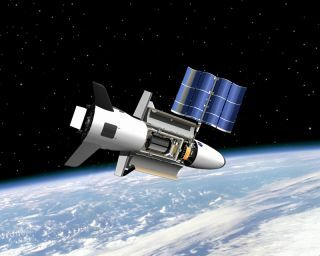 The X-37 program started in 1999 with NASA, which initially planned to construct two vehicles: an Approach and Landing Test Vehicle (ALTV) and an Orbital Vehicle. NASA transferred the project to the U.S. military in 2004 — specifically, the Defense Advanced Research Projects Agency (DARPA). At that point, X-37 became a classified project. DARPA finished the ALTV part of the program in 2006, conducting a series of captive-carry and free-flight tests. NASA's envisioned Orbital Vehicle was never built, but it served as the inspiration for the space plane that came to be called the X-37B. The X-37B program is now run by the Air Force's Rapid Capabilities Office, with mission control for orbital flights based at the 3rd Space Experimentation Squadron at Schriever Air Force Base in Colorado. The space planes are built by Boeing's Phantom Works division. Two different X-37B vehicles have flown a total of four missions, which are known as OTV-1, OTV-2, OTV-3 and OTV-4 (short for Orbital Test Vehicle). All four flights have reached space with the help of United Launch Alliance's Atlas 5 rocket. OTV-1 blasted off in April 2010 and stayed aloft for 224 days. OTV-2 stayed in space for more than twice as long, launching in March 2011 and returning to Earth 468 days later, in June 2012. OTV-3, which uses the same vehicle that flew the OTV-1 mission, began on Dec. 11, 2012, and ended 674 days later, in October 2014. The OTV-4 mission marked the second flight for the X-37B that flew OTV-2. OTV-4 began on May 20, 2015, and broke OTV-3's duration record on March 25, 2017. After 718 days in space, the OTV-4 mission ended with a smooth runway landing on May 7, 2017. It was the first X-37B landing at NASA's Shuttle Landing Facility at the Kennedy Space Center in Cape Canaveral, Florida. The three previous missions landed at Vandenberg Air Force Base. "The X-37 is a technology testbed, and as such, pushing the envelope is the mission," Joan Johnson-Freese, professor of national security affairs at the Naval War College in Newport, R.I., told Space.com, referring to OTV-3. "Endurance is one of several X-37 profile parameters that are being tested, along with others, such as in-flight capabilities and turnaround time for use." All X-37B missions to date have launched from Cape Canaveral Air Force Base in Florida. While the first three touched down at California's Vandenberg Air Force Base, future missions beyond OTV-4 may continue to land at NASA's Kennedy Space Center in Florida, right next door to Cape Canaveral, officials have said. Boeing is using an old NASA space shuttle hangar at KSC to service the X-37B space planes for the U.S. Air Force. The secrecy surrounding the X-37B and its payloads has spawned rumors that the vehicle could be a space weapon of some sort, perhaps tasked with capturing or damaging other nations' satellites. But the space plane is likely too small and not maneuverable enough for such work, experts say. Instead, its chief mission is likely what Air Force officials have claimed all along: to test out new sensors and other next-generation satellite technologies, to see how they perform and hold up in the space environment. "I absolutely think that's the primary mission," former Air Force orbital analyst Brian Weeden, who now works as a technical adviser for the nonprofit Secure World Foundation, told Space.com just before the launch of OTV-2. Various other aspects of the X-37B's design would make it a less-than-ideal space weapon, he added — including the craft's shuttle-style runway landings, which leave it vulnerable to attack by hostile forces.